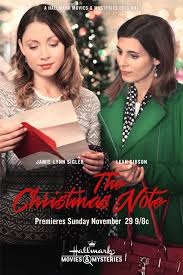 The Christmas Note (2015) Rated NR | What to Watch. Two new neighbors become friends and bond during a search for one of the women’s siblings. Based on the novel by Donna VanLiere. Starring Nicola Cavendish, Jessie Fraser, Leah Gibson, Jamie-Lynn Sigler, Greg Vaughan. This is an unusual Christmas film for Hallmark. It still has the usual, heartwarming Hallmark stamp, but the emphasis is on the gift of friendship instead of romance. There is a pretty predictable twist to the film that I figured out early on, but it was still sweet to watch it unfold. I thought Gibson and Sigler played their roles as neighbors with the warmth and depth needed for their burgeoning friendship. Although the movie doesn’t go into much detail about Sigler’s missing husband, the ending is still bittersweet. I think it is one of the better Hallmark movies this season and certainly worth a watch. This entry was posted in 2015, Based on a novel, Canadian Films, Christmas Films, films, hallmark movies, Movie reviews, movies, Rated NR, reviews and tagged based on the novel, books, christmas films, christmas movies, Donna VanLiere, film, film reviews, films, Greg Vaughan, hallmark, hallmark christmas films, hallmark christmas movies, Hallmark films, hallmark movies, husband, Jamie-Lynn Sigler, Jessie Fraser, Leah Gibson, life, loss, movie, movie reviews, movies, neighbors, Nicola Cavendish, one, sibling, The Christmas Note, trailer, twist, two, worth. Bookmark the permalink. Pingback: New This Week on DVD, October 3, 2017 | What to Watch.